Zcash is a privacy-protecting, digital currency built on strong science. Transact efficiently and safely with low fees while ensuring digital transactions remain private. Selectively share address and transaction information for auditing or regulatory compliance. 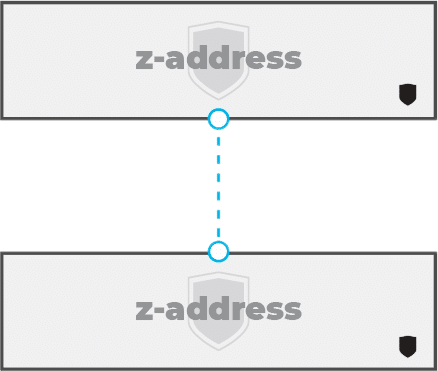 Zcash addresses are either private (z-addresses) or transparent (t-addresses). 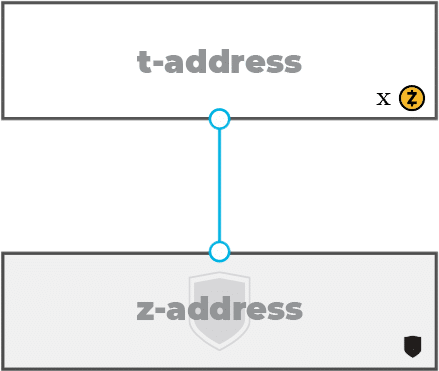 Z-addresses start with a “z,” and t-addresses start with a "t."
A Z-to-Z transaction appears on the public blockchain, so it is known to have occured and that the fees were paid. But the addresses, transaction amount and the memo field are all encrypted and not publicly visible. Using encryption on a blockchain is only possible through the use of zero-knowledge proofs. More information on these proofs and Zcash’s implementation of zk-SNARKs is available. The owner of an address may choose to disclose z-address and transaction details with trusted third parties — think auditory and compliance needs — through the use of view keys and payment disclosure. 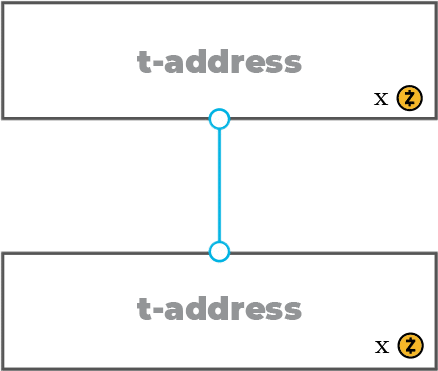 Transactions between two transparent addresses (t-addresses) work just like Bitcoin: The sender, receiver and transaction value are publicly visible. While many wallets and exchanges exclusively use t-addresseses today, many are moving to shielded addresses to better protect user privacy. The two Zcash address types are interoperable. Funds can be transferred between z-addresses and t-addresses. However, is important that users understand the privacy implications of shielding or de-shielding information through these transactions. More information on the various transaction types is available. Zcash supports fast transactions with a low fee of .0001 Zcash. Zcash is supported on a large number of top wallets and exchanges. 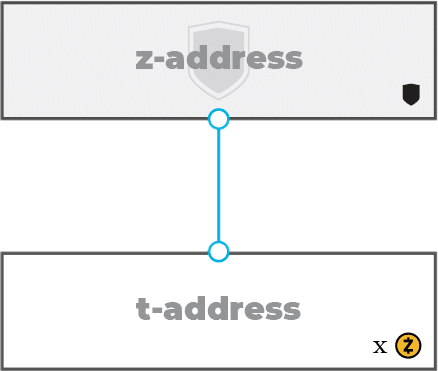 Zcash offers two types of addresses: shielded and transparent. Shielded addresses are not visible and transactions between shielded addresses do not reveal either address, the transaction amount or the contents of the encrypted memo field. Transparent addresses and transactions between them are publicly viewable on the Zcash blockchain, in the same way that Bitcoin addresses are viewable. A memo field is available for shielded transactions. This allows the sender to include relevant information to the receiver, completely encrypted. This is useful for passing along messages and instructions, or to ensure compliance with the Bank Secrecy Act "Travel" rule. Owners of shielded addresses can disclose transaction details for regulatory compliance or auditing. The owner has the option to disclose all incoming transactions and the memo field, but does not have access to the sender address unless identifying information is included in the memo field. Zcash will soon support full viewing keys that reveal all transaction values in and out of the address. Either the sender or receiver of a transaction may disclose transaction-specific details to 3rd parties as may be needed for visibility, compliance or auditing. The receiver may disclose a transaction value and memo but does not have access to the sender's address. This is currently an experimental feature. Zcash supports transaction expiration to minimize the impact of a non-mined transaction. By default, a transaction will expire and funds unencumbered if the transaction is not mined after 50 minutes (20 blocks). Zcash supports transactions that require multiple signatures. This means that a transaction may require two or more parties to agree to the transaction before funds are sent. However, multisignature transactions are transparent and cannot be made private. At the core of Zcash technology are zero-knowledge proofs, which allow transaction data to be validated without revealing information about the amount and the parties involved. Zcash uses specific zero-knowledge proofs called zk-SNARKs (zero-knowledge succinct non-interactive arguments of knowledge). Zcash is built on strong science and audited meticulously by third parties. It is an open-source protocol, built by a security-specialized engineering team, and originally based on Bitcoin Core's battle-tested codebase. To learn more about how the zero-knowledge proofs work, please visit the explainer page on zk-SNARKs. For developer resources, visit our Support page. The world of digital currencies is new to many, and it's understandable to have questions.